This week, I have finished the draught stopper AKA Sausage. Kid’s love it and want another one to play with! I don’t blame them, as I loved toying with it, too! I was right on spot thinking that I won’t have enough yarn, and I am glad I added a contrasting section in the middle, it would look less pretty I think, if it were just two sections. I also has another side project. 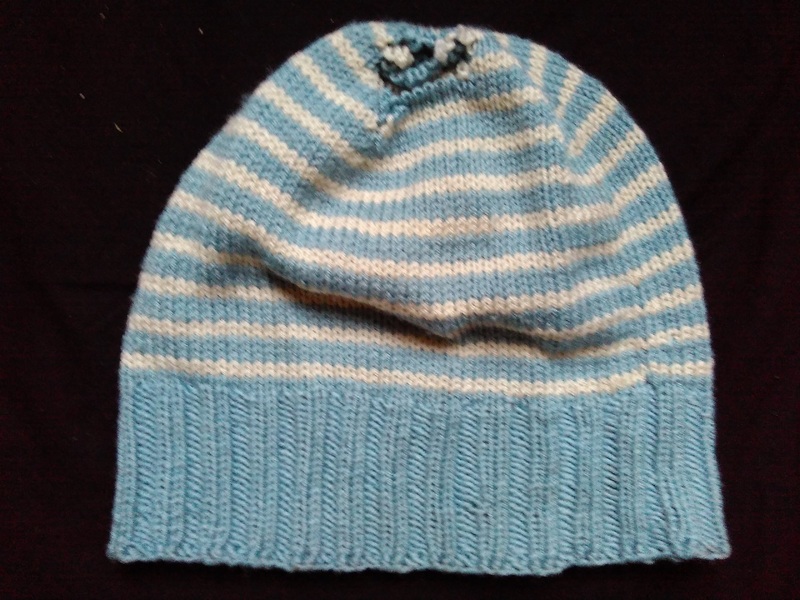 I knitted a beanie for my son when he was a toddler, I then added length to it, as it became too small, so that he could wear it longer. This winter, it got quite a large hole in it. 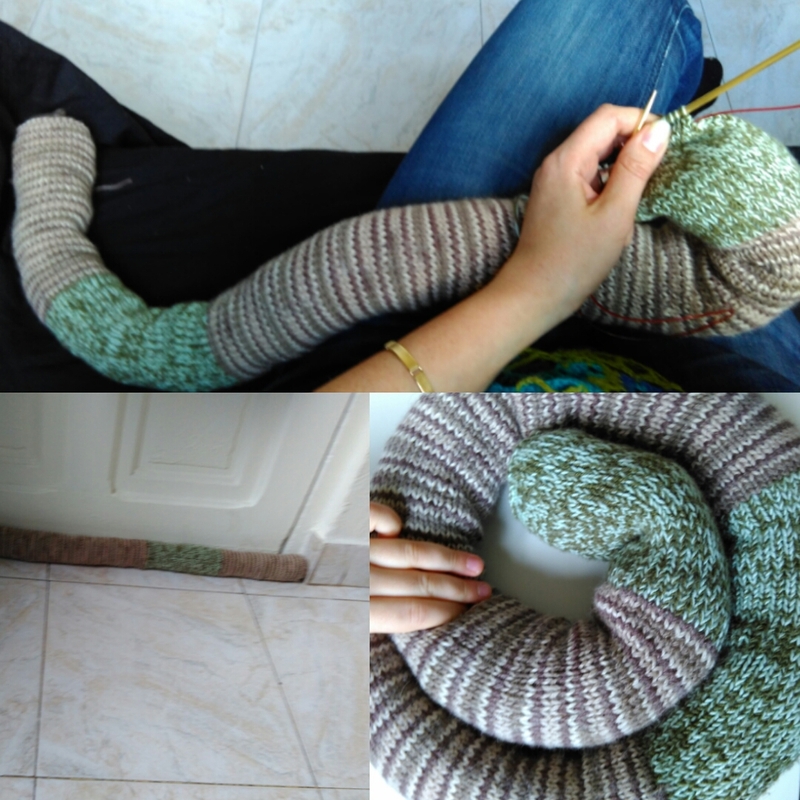 I hate the idea of throwing it out, as I quite liked it, and I love the yarn it’s made of (Champragne by Grignasco, a merino wool / silk blend). 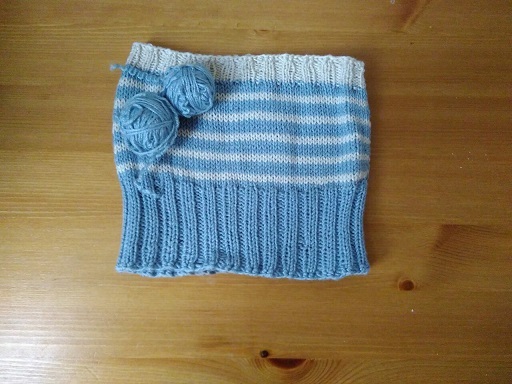 I wasn’t sure I could mend the hole, and I could not re-knit the crown as I have no yarn like this left. I stole the hat a couple of times for running and loved how snug it was on head, and how soft it was. So I decided to turn in into a headband for my running sessions, as it can be quite windy here, and I hate wind in my ears. Now I am now back to working on my large WIPs, of which there are three at the moment. Firstly, the table runner that I haven’t touched for a few weeks now. I was glad I had made some notes, as I was a bit clueless when I pick it up. Secondly, still working on Raspberry, Cream and Chocolate. 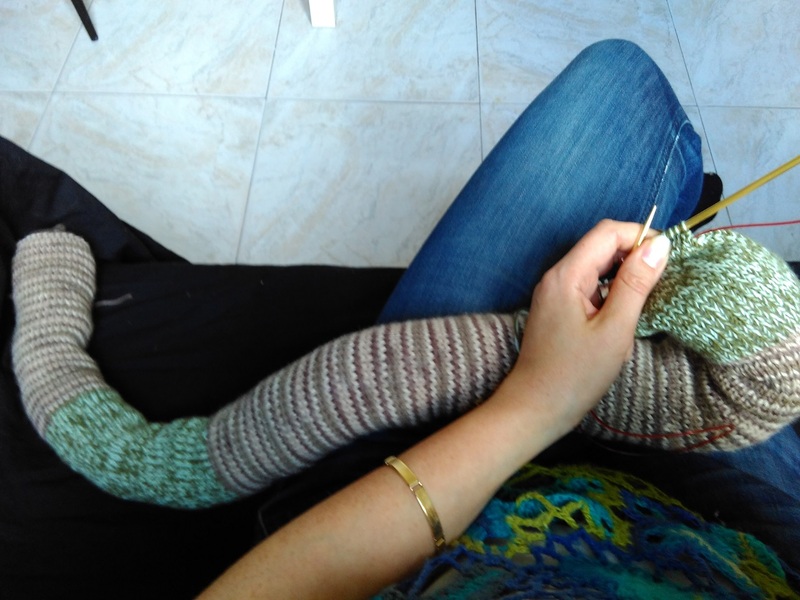 Still quite long road ahead of me… There probable will be changes to planned colour scheme, as I think I might run out of yarn and getting more is not really an option. 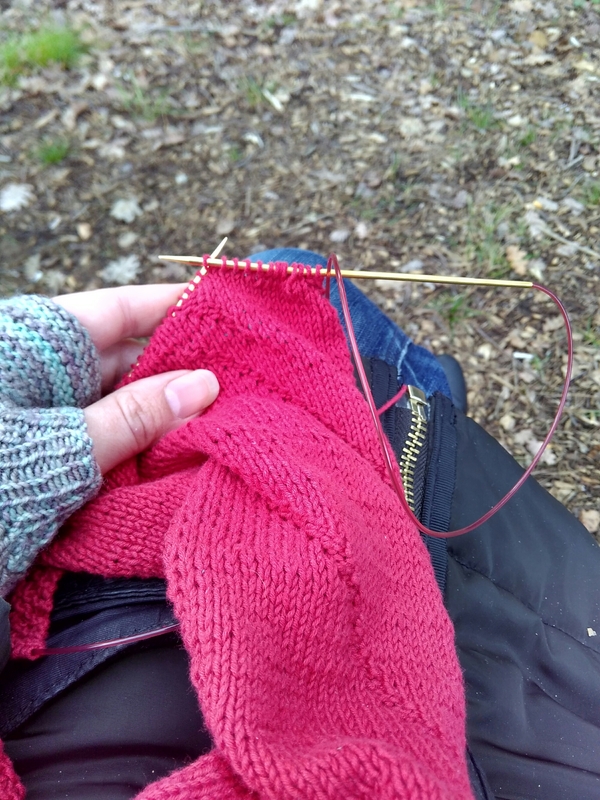 I also did more swatching for the second red dress… Still deciding on how it will look like, but a bit less lost now than I was last week. Well, that’s my crafting week. I hope to get a good move on these projects next week. Separator image Posted in My kniting & crochet and tagged with crochet, drought stopper, head bannd, knitted, knitting, wip, YOP. I actually thought of that, too. But to be honest, the yarn is quite worn, and may be tearing in other places anytime too! Gosh, I love the draught excluder and the headband is genius!! Wow, you’ve been busy. I think think the draught stopper is my most favorite thing pictured! I need to make one (or 6) of those. Yes, we have 6 doors that lead to the outside. And no, we don’t have a lot of house. Just a lot of doors. Thank you. I have to say that it does make a difference! 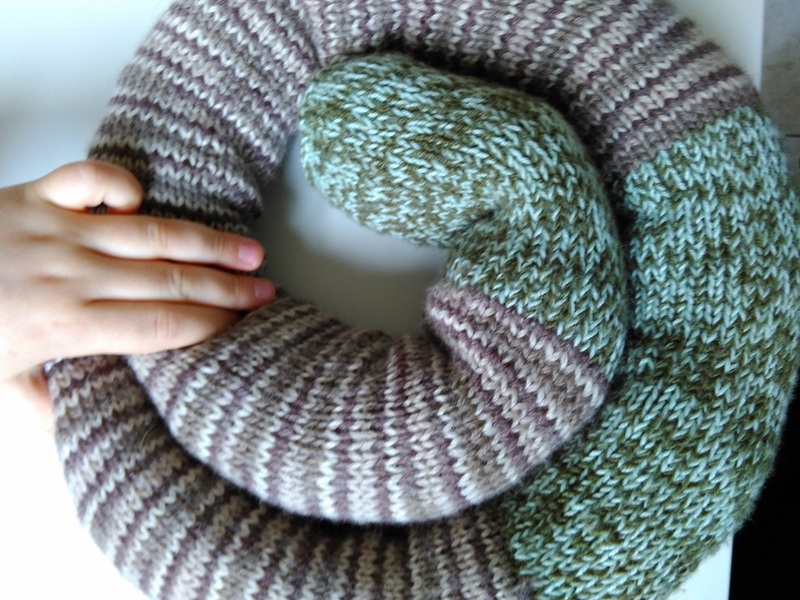 I’ve see some very pretty ones on Pinterest – like one that’s shaped as a sausage odg, for example! The draft stopper is really fun! I can see why the kids like it. As well, you’re right that the contrasting sections add to,it rather then detract. Great job recycling the hat. It is really cute. I hope you don’t run out of yarn on the Rasberry project. It looks so yummy and squishy in the photo. I can’t blame you for wanting to save that hat! 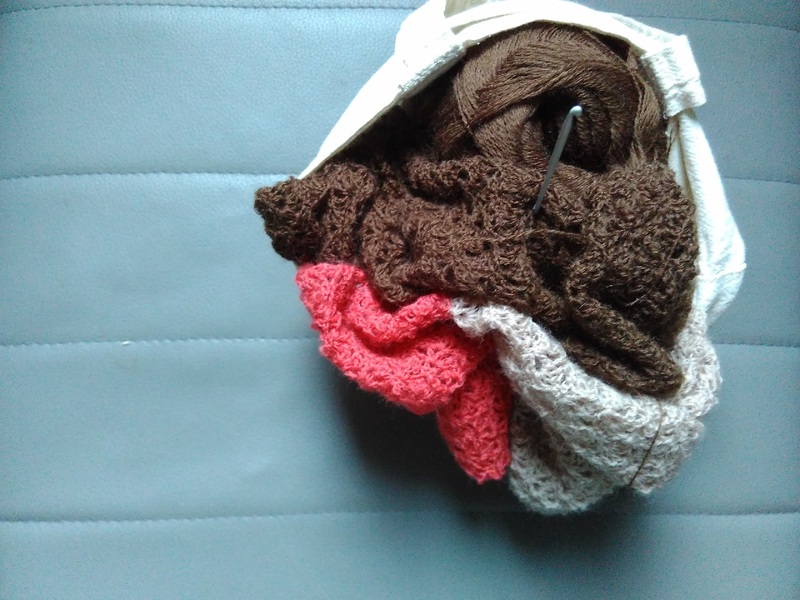 How did you save your stitches so they didn’t unravel….a lifeline? And then you added a ribbing? You are talented! I’m getting better but still have a long way to go especially for recovering from mistakes. 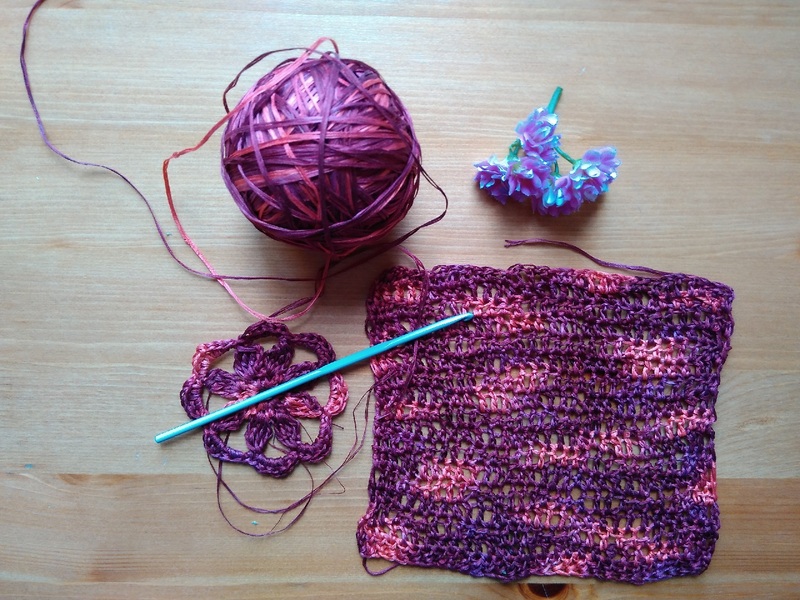 I love the raspberry and chocolate yarns…..yum! And the dress……very pretty colors. I hope you get lots done this week!